Perfect location.1-2 mins walk to beach. Free WiFi and total Sky package including Sports, Movies and BBC, ITV etc. Two large double bedrooms, a fully equipped kitchen, Spanish marbled bathroom and all-day sun terrace. This apartment has become a favourite with those looking for home-from-home comforts combined with Spanish charm and a central location, without the noise of any bars or restaurants. All this with just a 1-2 minute walk to the beach! For sun lovers there is a sun terrace to enjoy all-day sunshine - view includes the sea and mountains plus Fuerteventura, watch the sunset every night! Unless you want to see the rest of the island you really don't need a car. The apartment will suit couples, families and those at retirement age. Hello, we are Sophie and Dee. 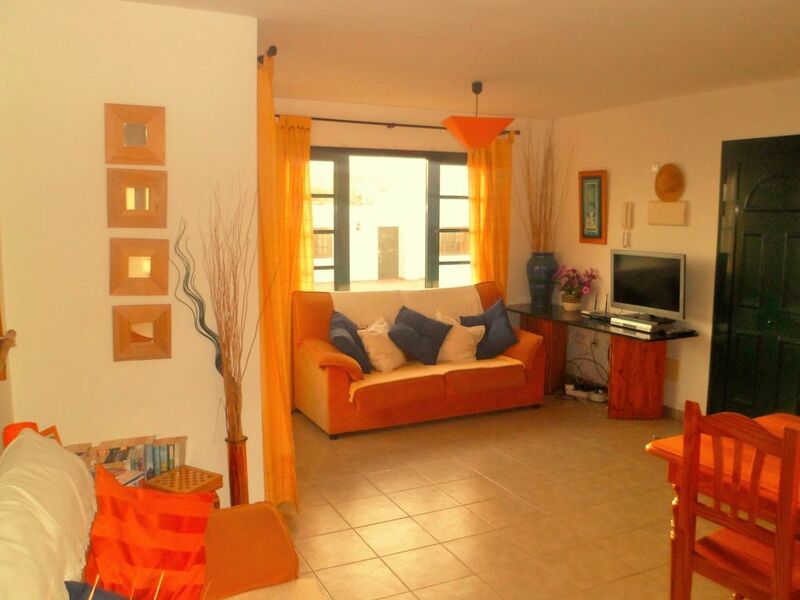 We live in London, but get out to our gorgeous apartment in Playa Blanca as often as we can! We have a nine-year-old son, who loves playing on the beach and swimming in the sea, and the marina pool. We love going there for winter sun, as well as enjoying the wonderful long evenings in the summer. We are confident you will fall in love with our place as much as we have. When we spotted the apartment for sale, it was love at first sight. There are hundreds of 'generic' apartments/villas in Playa Blanca, but our place really stood out as it has an authentic Spanish feel to it and is the perfect 'home from home'. Plus of course the location is fantastic - everything we need for a great holiday is in walking distance! The location is unbeatable - it's on a quiet side street in the heart of the Old Town, so no booming bar noise at night; but at the end of our road, literally 1-2 minutes' walk (depending on how fast you walk!) you reach the sea, restaurants, bars and shops. Dorada Beach, where we spend much of our time, is 3-4 minutes along the promenade, and the beautiful Marina, with its twice weekly markets, is 5 minutes walk along from there. The apartment itself is a joy to relax in, with table and chairs on the all-day-sun front patio, Wifi and everything you need for self-catering. New fully tiled Spanish marbled bathroom includes bath, shower, sink and bidet. Spacious charmingly furnished lounge and dining area opening onto front sun terrace. Includes Spanish satellite TV, DVD, CD and Ipod players etc. Dining table in kitchen area, and another table on the front patio for al fresco dining. Two 18-hole golf courses on Lanzarote, the nearest being the stunning course at Puerto del Carmen, 15 minutes' drive up the coast. Notes on accommodation: Wide screen TV. Free WiFi and total Sky package including Sports, Movies and BBC, ITV etc Outside: Sun terrace ensuring all-day sun, with front terrace including outside dining tables and fantastic views, plus rear solarium. Plenty of parking space out the front. Washing machine in rear solarium. Towels and linen included, and changed mid-stay for two-week bookings or longer. Cot and high chair available at additional charge. We had another good holiday, our 5th, in Playa Blanca in this lovely apartment. Its location is the best we've had for access to the beach, the promenade , excellent eating places, and no parking problems. Two minor comments; we couldn't get the hair drier to work but that is easily sorted and we would like to have had 2 front door keys. Great Apartment, Great Location, Great Weather! Already booked for next year, same weather again please! The apartment is quite close to all the amenities, and was probably a much nicer place to spend a week a few years ago, but is showing its age. The springs of the mattress were very prominent, which makes the bed not the most comfortable, and there were various other 'little' things not quite working. Despite reporting the WiFi not working, the chap who rang us back while we were out, didn't ring back at 7:45 as promised, so we had no WiFi while we were there. Couldn't be bothered to chase it - we were on holiday and have enough of chasing people up in the UK! Despite that we had a great week and loved Playa Blanca. We'll probably be back - but not here. We pride ourselves on looking after our guests, and providing a lovely 'home from home' in a wonderful location (hence all our great reviews) and it is with a heavy heart that we say - for the very first time ever - we would refuse to book this person again. He did report an issue with the wifi three days into his holiday - something that has not happened before or since - we contacted him within 30 minutes of his message to sort it out, and were on the receiving end of a barrage of abuse and insults. We got our internet person to call him within 15 minutes, but the guest didn't answer his phone, despite repeated attempts to contact him, and we heard nothing more from him. Upon investigation after his stay, we found the cause of the wifi issue - he had unplugged everything including our internet TV! The guest made no reference to any other little things 'not quite working' - what these were still remains a mystery, and had he flagged up any issues we would have attended to them immediately, as always. With regards to 'showing its age', the apartment was fully decorated this summer. We feel this guest would be better suited to a 5-star hotel rather than a self-catering apartment, and are delighted that all our other guests love our place, many of them rebooking over and over again. Apartment nice and plenty of room, was well kept and very clean, the sky package on tv was great. Apartment short walk from beach and close to all the bars and restaurants, could not want for anything. Will book again. We had a great stay in this apartment, very helpful owners and brilliant location. The only downside was the fair at the carpark, very noisy. We soon got used to the noise and obviously not down to the owners. All in all we had a lovely stay, suited us down to the ground. We would happily book again if we come back to Lanzarote. Two minute walk to Playa Blanca beach, promenade, shops, bars and restaurants. 25 minutes from Arrecife airport. We advise about local car hire / taxis from the airport in our welcome pack. Booking Notes: 50% deposit to secure your booking - the balance is then due 8 weeks prior to departure. £7.50 per person per night if more than two guests Changeover Day: This is totally flexible - we accept arrivals/departures on any day, subject to availability of course.